Last week Wigwam reported on the situation at the port of Albany, where Global Partners is trying to expand by putting in boilers to heat up crude oil from the Bakken oil fields and other sources for transfer to barges on the river, making the Hudson a virtual oil pipeline, with all the attendant risks to our communities. Scenic Hudson, Riverkeeper, and the National Resources Defense Council are asking the public to attend a hearing this Wednesday, February 12, in Albany. With very little public awareness and no study of environmental impacts, the oil industry has made the Hudson Valley into one arm of a dangerous “virtual pipeline” for crude oil that snakes thousands of miles by rail, barge and ship from oil fields in North Dakota and elsewhere, to refineries on both coasts. Today, the New York State segment of this “virtual pipeline” primarily moves a particularly volatile crude oil by rail from the Bakken shale formation of North Dakota and nearby states and provinces, where oil production has doubled in three years, to the Port of Albany. There, billions of gallons of crude oil can be offloaded onto barges and ships destined for East Coast refineries. Additional trains loaded with crude oil destined for refineries to the south continue through along the west side of the Hudson River, through communities in Greene, Ulster, Orange and Rockland counties. HUDSON VALLEY, NY – February 7, 2014 – Natural Resources Defense Council, Riverkeeper, and Scenic Hudson commend Governor Cuomo for issuing a January 28, 2014 Executive Order that identifies the immediate major risks to New York communities and waterways, including the Hudson River, from the significant increase in transport of unrefined petroleum products by rail, ship and barge and that directs five state agencies to report by April 30 on the state’s preparedness to handle a potential crude oil spill or fire resulting from that transport. The environmental groups also strongly support the Cuomo Administration’s call for federal agencies to strengthen regulations and controls over rail and vessel shipments of these hazardous materials. The groups call on Governor Cuomo to take additional steps to safeguard New York’s environment and public safety from the ongoing risk of the devastating impacts of a spill, explosion or fire that communities and the environment in the U.S. and Canada have suffered repeatedly over the past several months. 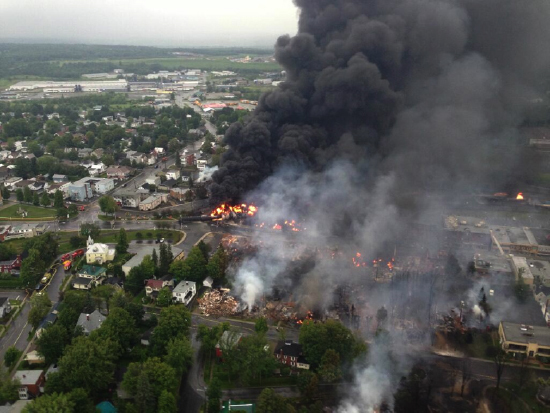 The wiki commons photo above shows the July 2013 train shipment of Bakken crude derailed in Quebec. 47 people were killed. Well. That’s disturbing. To put it mildly. Weekend Slide Show: Beacon Spirit! Bike Your Park Day in Beacon! “Long Term” Barge Anchorage Off Beacon’s Dennings Point?